I just got back from Mexico last last night. I went to La Paz, which is in Baja California. My brother and his family is spending several months there, and I went down to visit with my parents. It was a great trip. The water was beautiful, it was warm, and I really enjoyed visiting family. We did some great activities as well. We went on a whale watching camping trip where we went on boat trips twice a day to visit and even touch grey whales. We also saw sea lions and went snorkeling. We visited a few other cities in Mexico called San Ignacio, Loreto, and Santa Rosalia. They were all beautiful cities. It was a great trip, and I'm a little sad to get back to my regular life. 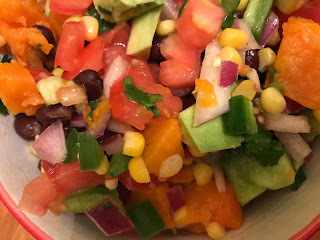 I made this southwest salad today. I will be eating for lunch all week. I made up the recipe myself. 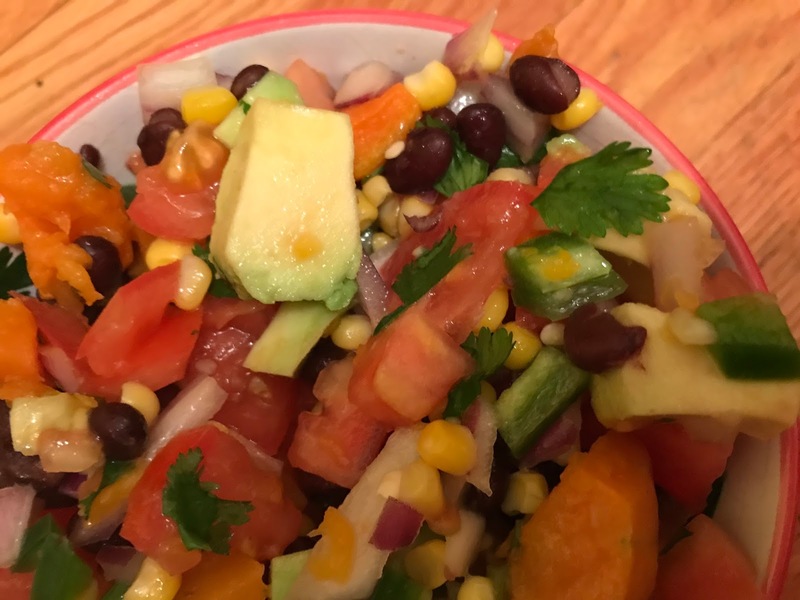 The ingredients are 32 ounces butternut squash, 3 tablespoons extra virgin olive oil, salt, 4 ounces frozen corn, 11 small tomatoes, 1 green pepper, 2 jalapeños, 1 red onion, 2 cans black beans, 1 bunch cilantro, 3 avocados, 2 limes, and salt. I sprinkled on about a tablespoon of extra virgin olive oil on the cubed butternut squash. I baked the squash at 400 degrees with about 30 minutes. I stirred the squash after 15 or 20 minutes. I chopped the tomatoes while the squash baked. I also chopped up the green pepper and jalapeño peppers. I added these ingredients into a large bowl. I chopped up the red onion and cilantro. I added these ingredients to the bowl as well. I chopped up the avocados and added them to the bowl. I then sprinkled the lime juice of two limes over the avacadoes. I added the butternut squash and black beans. I added the remaining olive oil and salt. I stirred all the ingredients up together thoroughly. This is a bright and fresh salad. It has a little acidity from the limes and a little heat from the jalapeños. 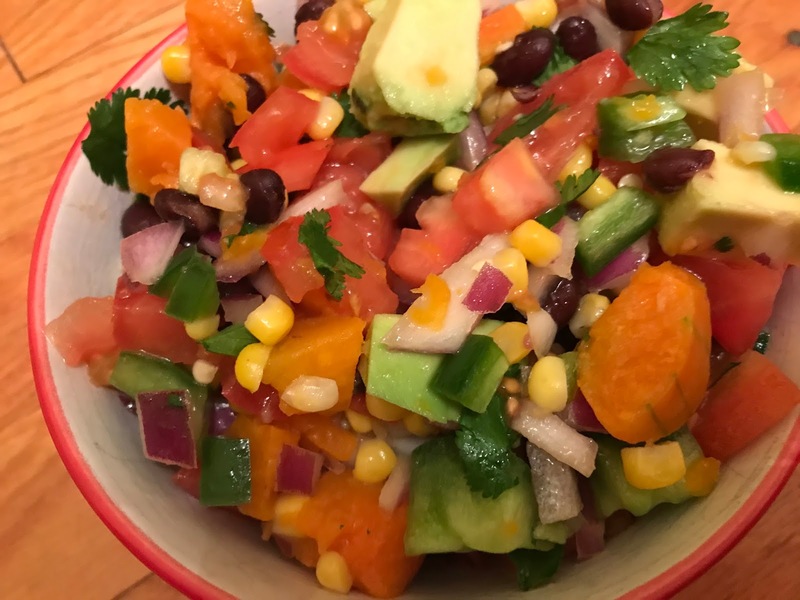 It is a colorful and attractive salad as well. The vegetables are all varied and well balanced. The corn, beans, and squash make the salad a little more hearty. 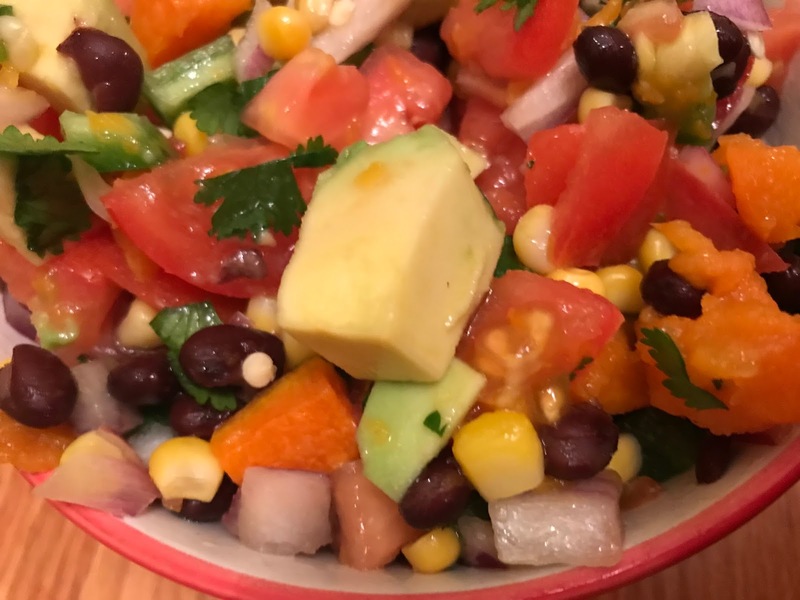 It is a scrumptious salad with delicious flavors. I would made this salad again.